Korean cuisine includes garlic, spicy red peppers and substantial soups and stews with meat, vegetables and noodles. Seafood is a central part of Korean culture, and dried squid can be a snack on its own or as part of a recipe for lunch or dinner. 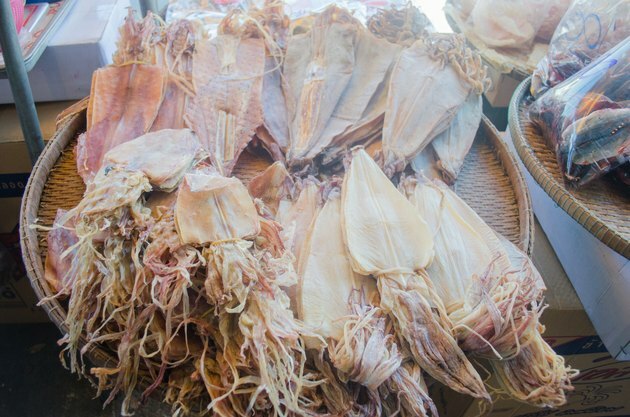 Dried Korean squid can be a nutritious addition to your diet if you eat it in moderation. Each whole dried squid has 204 calories. It is free from carbohydrates, including sugars and dietary fiber. A serving has 42 grams of protein, or 84 percent of the daily value for individuals on a 2,000-calorie diet. Seafood is high in cholesterol, and dried squid has 186 milligrams, or 62 percent of the daily value. Dietary cholesterol raises levels of unhealthy cholesterol in your blood and increases your risk for heart disease. A whole dried squid contains 4 grams of total fat and no trans fat. Squid is among the top dietary sources of omega-3 fats, according to the U.S Department of Agriculture. Your risk of heart disease may decrease when you eat two servings per week of seafood because it contains omega-3 fats. Other sources of these heart-healthy fats include fatty fish -- such as tuna, salmon, herring -- and other shellfish, such as shrimp and crab. A whole dried squid has 608 milligrams of sodium. Sodium raises your blood pressure and can lead to an increased risk of heart disease and stroke. Healthy adults should have no more than 2,300 milligrams of sodium per day, while individuals with hypertension and older adults should limit their intake to 1,500 milligrams, according to the USDA. You get more sodium if you prepare your dried Korean squid with a salty sauce, such as soy sauce or fish sauce. Dried Korean squid provides 16 percent of the daily value for calcium and 10 percent of the daily value for iron. Calcium is an essential nutrient for building and maintaining strong bones and teeth. Dairy products, fortified tofu and orange juice, and canned fish are also high in calcium. Iron is necessary for preventing iron-deficiency anemia. Women of child-bearing age and children are at higher risk for inadequate iron intake. The iron from animal-based sources, such as squid, is more absorbable than iron from plant-based sources, such as beans.